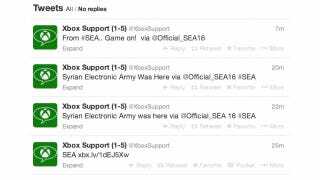 The Syrian Electronic Army, ostensibly a political activist group, must have had some downtime over the weekend, because instead of going after political opponents of the Syrian leadership they went and hacked one of Xbox's Twitter accounts. The company's Xbox Support account - which sounds like a rough place to work - was taken over for around 45 minutes over the weekend, The Drum reports. In that time, they posted a few "waz 'ere" style messages, along with links to the SEA's website. I kid about downtime; the intrusion was part of a campaign against Microsoft sites, which has seen the company's News, Facebook and Skype accounts hacked as well.